This article is about the song. For other uses, see American Boy (disambiguation). 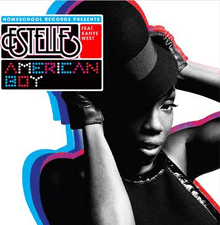 "American Boy" is a song recorded by British rapper and singer Estelle for her second studio album Shine (2008). It features vocals from American rapper Kanye West. The song was written by Estelle, West, will.i.am, John Legend, Josh Lopez, Caleb Speir, and Keith Harris. It was produced by will.i.am, who also produced the album's previous single, "Wait a Minute (Just a Touch)", and uses the beat from the song "Impatient" from his own third studio album Songs About Girls (2007). "American Boy" is a breezy disco-funk song that lyrically describes a romance with an American suitor. The song's conception came after Legend, Estelle's mentor, suggested she write a song about meeting an American man. "American Boy" was released by Atlantic Records as the album's second single on 31 March 2008. The song received positive reviews from music critics, who praised its fresh sound and production. The song reached the top five in many European and Oceanic markets, including Belgium and Estelle's native United Kingdom where it reached the chart's summit. It also achieved success in the United States, peaking at number nine on the Billboard Hot 100 and becoming Estelle's breakout song in the country. The song earned many nominations, and ultimately won a Grammy Award for Best Rap/Sung Collaboration. The music video, featuring a variety of celebrity guests, earned a Video Music Award nomination for Best UK Video. As a result of the song's popularity, Estelle performed it at several award shows and venues. "It’s a song as breezy as air, so carefree its gorgeously channeled vocals practically float off from the grounded four-on-the-floor disco beat and Quincy-Jones-producing-Michael-Jackson funk bass. It’s a pure pop gem with a joyful bounce, verdant in textures (particularly the sunglassed analogue synth stabs), contagiously catchy, danceable and singable, and lyrically devoid of depth or scope, like an aimlessly pleasant walk in the park." — Timothy Gabriele of PopMatters commenting about "American Boy". "American Boy" was written by Estelle, will.i.am, John Legend, Kanye West, Josh Lopez, Caleb Speir and Keith Harris. It was also produced by will.i.am and recorded over the instrumental of his song "Impatient", from his third studio album Songs About Girls (2007). The credits of Lopez, Speir, and Harris were the result of this sampling. In a 2008 interview with Pete Lewis of Blues & Soul, Estelle explained how the song came to fruition: "We were just messing about in the studio, joking around. And John (Legend) just said to me 'Why don't you write a song about meeting an American boy?'. So I was like 'Well, that's pretty easy' - because I have a lot of male friends out there in New York. And I unwittingly ended up creating a new ladies' anthem!" She also spoke about West's involvement on the song, commenting "Kanye basically just brought his own cheeky self to the track, his own sense of humour. At first he was like 'How can you rap over a dance beat?' - and now he's DONE it!" Instrumentation on the track includes drums, keys, synths, and bass; the former were provided by will.i.am while Caleb Speir provided the latter. will.i.am also co-recorded and co-engineered the song with Padriac Kerin at The Record Plant in Hollywood, Florida as well as Hit Factory Criteria and Circle House Studios in Miami. Serge Tsai mixed the song and recorded West's rap at Platinum Sound Recording Studios in New York City. "American Boy" is a disco and funk song that, according to the sheetmusic published at Musicnotes.com by Alfred Publishing Co., Inc., is set to metronome of 120 beats per minute. Estelle's vocals, which have been described as "sweet" and "flirty", ranges from B3 to D5. Timothy Gabriele of PopMatters described Estelle's vocals as those of one connecting "with her inner soul chanteuse." West's rap verse has been described by New York Times's Jon Caramanica as "perfunctory" and idling "cool". Lyrically, the song describes a foreign woman's interest in a male American suitor, listing places such as New York and Los Angeles as sites she wants to visit. Timothy Gabriele of PopMatters found the song's lyrics to be about "the thrill of new experience, the excitement of a being in a fresh, unexplored environment while simultaneously meeting someone new." "American Boy" was released as the second single from Shine on 24 March 2008. "American Boy" was released on third CD single formats, as well as a promo single, a maxi single, and 12" picture discs. The second CD single contains a radio remix of the song by UK dance and remix group Soul Seekerz. The third CD single features "Lift to Me", a song recorded by American rapper and producer Hi-Tek, featuring Estelle, for his fourth studio album Hi-Teknology 3(2007). It also includes the music video for the single. The maxi single includes several remixes of the song by Soul Seekerz and TS7 as well as the uncensored version, the version excluding West rap segment, and the song's instrument. The promo single features remixes by TS7 and different versions of the single. The 12" disc includes the TS7 remix and remixes of the previous single "Wait a Minute (Just a Touch)" by British electronic duo The Count & Sinden and British disc jockey Aaron Ross. The 12" promo features "Wait a Minute (Just a Touch)" and instrumental versions of both songs. Mariel Concepcion of Billboard called "American Boy" "a charming duet with West." Andy Kellman of Allmusic, Luke Bainbridge of Observer Music Monthly and Sal Cinquemani of Slant Magazine named the song as a standout on its parent album. Bill Lamb of About.com gave the song a four star rating, listing the chemistry between Estelle and West, the song's beat and Estelle's vocals as the song's highlights. Lamb also added "This song is perfection for a slick, summery glide across the dance floor." Alex Fletcher of Digital Spy found "American Boy" to "boasts bags of self-confidence ("Don't like his baggy jeans but I like what's underneath 'em," she purrs at one point), a winning chorus and sultry, super-sleek production from Will.i.am and John Legend" while commenting "it shouldn't have taken a guest spot from the self-proclaimed King of Hip-Hop to make this tune a hit." Timothy Gabriele of PopMatters called the song "an essential piece of ebullient summer musical manna rained down from empyreal heights and granted to us passive listeners as one final gift before the world spirals off into an inescapable vortex of cyclones, earthquakes, economic collapse, and a doom-sealing Presidential race." Joshua Love of Pitchfork praised the song's hook and will.i.am's production work. while Omar Jenning of The Skinny was dismissive of West's rap interlude. Ben Hogwood of musicOMH lauded the song as an example of how "Estelle has added a large pinch of soul to take her music to the next." In 2009, "American Boy" earned Estelle and Kanye West a Grammy Award for Best Rap/Sung Collaboration while receiving a nomination for Song of the Year. The song received a nomination for BRIT Award for Best British Single. "American Boy" was listed number 7 on the 100 Best Songs of 2008, published by the music magazine Rolling Stone. The song also ranked 238th on the Top 500 songs of the 2000s, published by Pitchfork Media. The Village Voice's Pazz & Jop annual critics' poll ranked "American Boy" at number 2 to find the best music of 2008, after M.I.A. 's "Paper Planes". "American Boy" proved to be an international success, outperforming Estelle's previous singles in the United Kingdom and stands as her most successful single worldwide. In the United Kingdom, the song debuted at number 72 on 15 March 2008. It dropped out of the Top 75 the following week and re-entered at number one a week later, where it remained for four consecutive weeks. It lasted thirty two weeks on the singles chart, earning a platinum certification for sales exceeding 600,000 copies. It landed on the UK year end chart at number six and on the end of the decade chart at number 83. In Ireland, "American Boy" entered the singles chart number eight and rose to peak at number two one week later. In the Flanders region of Belgium, "American Boy" entered the chart at number 41 on 26 April 2008. The song advanced to the top twenty in the following week and inside the top ten three weeks later. It reached the chart's summit on 7 June 2008, where it remained for another week. The song charted in the top five for eleven consecutive weeks and lasted a total of twenty four weeks on the chart. "American Boy" reached number four in the Wallonia region of Belgium and lasted twenty five weeks on the chart. The song also reached number one in Slovakia; number three in Denmark, France, Hungary and Italy; and number five in Germany, the Netherlands, and Switzerland. In Australia, "American Boy" entered the singles chart at number seven, earning the title of the weeks "highest debut". The song rose to number three four weeks later, where it stayed for three consecutive weeks. "American Boy" earned a platinum certification by the Australian Recording Industry Association (ARIA) for sales exceeding 70,000 units. In New Zealand, the single debuted at number 25 on 31 March 2008 and rose to its peak position of number five four weeks later. The song remained on the chart for thirteen more weeks. "American Boy" experienced great chart success in the United States. The song debuted on the Billboard Hot 100 on 3 May 2008, slowing rising the chart until it reached number 11 almost four months later. It was later removed from iTunes resulting in its fall to number 37 on 6 September 2008. The song was re-added to iTunes, causing a resurgence in downloads that aided its rise to its peak position of number nine on 27 September 2008, selling 91,000 downloads. "American Boy" became Estelle's highest charting single in the United States, ahead of "Thank You" (2011), which only peaked at number 100. It ended the year at number 39 on the Hot 100 year-end chart and as the thirty-third best selling song of 2008. The song was also her best selling single there, selling 2 million downloads and earning a double platinum certification by the Recording Industry Association of America (RIAA). The music video for "American Boy" was directed by Syndrome. It features guest appearances by John Legend, Kardinal Offishall, Sa-Ra's Taz Arnold, Kidz in the Hall's Naledge and Double-O, Danger Mouse, Consequence, Hi-Tek, Ryan Leslie, T.I., Brandon Hines, LL Cool J, and 106 & Park's Terrence J, among others. The music video was nominated for Best UK Video at the 2008 MTV Video Music Awards, but lost to The Ting Tings' single "Shut Up and Let Me Go" (2008). The video also ranked at number 45 on BET's Notarized: Top 100 Videos of 2008 countdown, while its spin-off channel BET J listed it at number 10 on the year-end Last Call 2008! Top 50 Countdown. Estelle performed "American Boy" at various awards show, where the song also earned her nominations for several categories. She first performed it on The Friday Night Project on 21 March 2008. Estelle performed the song with Kanye West at the Fête de la Musique on 21 June 2008. She performed the song at the 2008 MTV Europe Music Awards with Kanye West singing his rap section, during an image of then newly elected United States president Barack Obama appeared on a giant screen. She later performed it at the 2008 World Music Awards, hosted in Monte Carlo, Monaco, with a live band. Estelle performed a mash up of the song with the Ting Tings "Shut Up and Let Me Go" and "That's Not My Name" at the 2009 BRIT Awards. West also performed the track at the Coke Live Music Festival in 2011. Busta Rhymes produced a remix version of the song with Estelle, taking over Kanye West's rap section. The song has also been covered by many artists, including Kid Mac BMK and Casey Donovan, Fall Out Boy, and Sam Sparro. Most notably, Sparro's acoustic rendition of the song was performed on BBC Radio 1's Live Lounge appearing on the station's third compilation album and as a B-Side to his single "21st Century Life". Popular versions include a shortened, lively jazz a cappella rendition performed by Howard University's Afro Blue during Season 3 of the NBC hit show The Sing-Off. The song has also received international parodies, with the name being changed to the synonymous countries. These parodies include Hamish & Andy's "Armenian Boy", Only Won and Larissa Lam's "Cantonese Boy", Bost & Bim's "Jamaican Boy", and Chris Moyles' "Somerset Boy". In a 2009 episode of Gavin & Stacey, James Corden & Sheridan Smith performed West's second verse in character as Smithy and Rudi. In 2014, Blaine Anderson (Darren Criss) and Kurt Hummel (Chris Colfer) covered the song in the Glee season-finale episode "The Untitled Rachel Berry Project." These are the formats and track listings of major single releases of "American Boy". Recorded and engineered at The Record Plant in Hollywood, Florida; Hit Factory Criteria Miami and Circle House Studios in Miami. Mixed and recorded (West's vocals) at Platinum Sound Recording Studios in New York City. Credits adapted from the liner notes of Shine, Atlantic Records, HomeSchool Records. 1 2 3 4 5 Gabriele, Timothy (27 May 2008). "Estelle: Shine". PopMatters. Retrieved 23 January 2014. 1 2 3 4 5 Lamb, Bill. 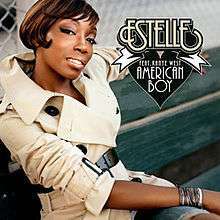 "Estelle featuring Kanye West - "American Boy"". About.com. Retrieved 23 January 2014. 1 2 Lewis, Pete. "To Estelle and Back". Blues & Soul. Retrieved 29 January 2014. 1 2 "Digital Sheet Music – Estelle "American Boy"". MusicNotes.com. EMI Music Publishing. 1 2 Kellman, Andy. "Shine - Estelle". AllMusic. Rovi Corporation. Retrieved 18 January 2014. ↑ Jon, Caramanica (5 May 2008). "CRITICS' CHOICE New CDs". New York Times. The New York Times Company. Retrieved 27 January 2014. ↑ "American Boy". HMV. HMV Digital Limited. Retrieved 2 February 2014. 1 2 "Estelle Feat. Kanye West – American Boy (CD, Single)". Discogs. Zinc Media, Inc. Retrieved 30 January 2014. 1 2 "Estelle Feat. Kanye West – American Boy (CD, Single, Enhanced)". Discogs. Zinc Media, Inc. Retrieved 30 January 2014. 1 2 "Estelle Feat. Kanye West – American Boy (CDr, Maxi-Single, Promo)". Discogs. Zinc Media, Inc. Retrieved 30 January 2014. 1 2 "Estelle Feat. Kanye West – American Boy (CDr, Single, Promo)". Discogs. Zinc Media, Inc. Retrieved 30 January 2014. 1 2 "Estelle Feat. Kanye West – American Boy". Discogs. Zinc Media, Inc. Retrieved 30 January 2014. 1 2 "Estelle Feat. Kanye West – American Boy (Vinyl, 12", Single, Promo)". Discogs. Zinc Media, Inc. Retrieved 30 January 2014. 1 2 Fletcher, Alex (11 March 2008). "Estelle ft. Kanye West: 'American Boy'". Digital Spy. Hearst Magazines UK. Retrieved 23 January 2014. ↑ Bainbridge, Luke (15 March 2008). "Reviews: 11-25". The Observer. Guardian News and Media Limited. Retrieved 27 January 2014. ↑ Cinquemani, Sal (22 April 2008). "Estelle: Shine". Slant Magazine. Retrieved 23 January 2014. ↑ Love, Joshua (27 May 2008). "Estelle: Shine". Pitchfork. Pitchfork Media Inc. Retrieved 23 January 2014. ↑ Jenning, Omar (23 April 2008). "Estelle - Shine". The Skinny. Radge Media Limited. Retrieved 23 January 2014. ↑ Hogwood, Ben (31 March 2008). "Estelle – Shine". musicOMH. OMH. Retrieved 27 January 2014. ↑ "GRAMMY.com". Archived from the original on 4 December 2008. Retrieved 3 December 2008. ↑ "Lil Wayne, Coldplay Lead Nominations for 51st Annual Grammy Awards". Rolling Stone. Wenner Media. 2008-12-03. Retrieved 2011-08-18. ↑ "Estelle". BRIT Awards. BRIT Awards Ltd. Archived from the original on 17 January 2014. Retrieved 26 January 2014. ↑ "The 100 Best Singles of 2008". Rolling Stone. 25 December 2008. Archived from the original on 29 December 2008. Retrieved 26 January 2014. ↑ "Staff Lists: The Top 500 Tracks of the 2000s: 500-201". Pitchfork Media. 17 August 2009. Archived from the original on 22 June 2010. Retrieved 2010-06-20. ↑ "UK Singles Chart (March 29, 2008)". The Official Charts Company. 29 March 2008. Retrieved 18 January 2014. 1 2 "Chart Track: Week 13, 2008". Irish Singles Chart. Retrieved 6 April 2011. 1 2 3 "Ultratop.be – Estelle feat. Kanye West – American Boy" (in Dutch). Ultratop 50. 1 2 "Ultratop.be – Estelle feat. Kanye West – American Boy" (in French). Ultratop 50. 1 2 "SNS IFPI" (in Slovak). Hitparáda – Radio Top 100 Oficiálna. IFPI Czech Republic. Note: insert 200822 into search. 1 2 "Danishcharts.com – Estelle feat. Kanye West – American Boy". Tracklisten. 1 2 "Lescharts.com – Estelle feat. Kanye West – American Boy" (in French). Les classement single. 1 2 "Archívum – Slágerlisták – MAHASZ" (in Hungarian). Rádiós Top 40 játszási lista. Magyar Hanglemezkiadók Szövetsége. Retrieved 6 April 2011. 1 2 "Italiancharts.com – Estelle feat. Kanye West – American Boy". Top Digital Download. Retrieved 6 April 2011. 1 2 "Musicline.de – Estelle feat. Kanye West Single-Chartverfolgung" (in German). Media Control Charts. PhonoNet GmbH. 1 2 "Nederlandse Top 40 – Estelle feat. Kanye West search results" (in Dutch) Dutch Top 40. 1 2 "Swisscharts.com – Estelle feat. Kanye West – American Boy". Swiss Singles Chart. ↑ "Australian Singles Chart (May 18, 2008)". ARIA Top 50 Singles. Hung Medien. 18 May 2008. Retrieved 18 January 2014. 1 2 "Australian-charts.com – Estelle feat. Kanye West – American Boy". ARIA Top 50 Singles. 1 2 "Charts.org.nz – Estelle feat. Kanye West – American Boy". Top 40 Singles. ↑ "Billboard Hot 100 (May 3, 2008)". Billboard. aCharts.us. Retrieved 18 January 2014. ↑ "Billboard Hot 100 (August 30, 2008)". Billboard. aCharts.us. Retrieved 18 January 2014. ↑ "Billboard Hot 100 (September 6, 2007)". Billboard. aCharts.us. Retrieved 18 January 2014. ↑ Grein, Paul (16 September 2008). "Week Ending Sept. 14, 2008: Metallica And The Hard Rock Pantheon". Chart Watch. Yahoo! Music. Retrieved 18 January 2014. ↑ "Billboard Hot 100 (September 27, 2008)". Billboard. Prometheus Global Media. 27 September 2008. Retrieved 18 January 2014. ↑ Grein, Paul (31 December 2008). "Chart Watch Extra: The Year That Songs Overtook Albums". Chart Watch. Yahoo! Music. Retrieved 1 February 2014. 1 2 Grein, Paul (6 October 2009). "Week Ending Oct. 4, 2009: A Debut Like Buttah". Chart Watch. Yahoo! Music. Retrieved 18 January 2014. ↑ "2008 MTV Video Music Awards - Best UK Video". MTV Networks. MTV (Viacom). Archived from the original on 13 September 2008. Retrieved 29 January 2014. ↑ "Ting Tings Win at The VMAS". MTV Networks. MTV (Viacom). Archived from the original on 15 September 2008. Retrieved 29 January 2014. ↑ "Fête de la musique sur France 2 : Duffy, Estelle, Willem attendus" (in French). Le Blog TV News. 6 June 2008. Retrieved 31 January 2014. ↑ Daily Mail Reporter (7 November 2008). "Quick-change Katy Perry wows the MTV Awards in TEN different outfits". Daily Mail. Retrieved 31 January 2014. ↑ "Singer Estelle performs at the World Music Awards 2008 at the Monte Carlo Sporting Club on November 9, 2008 in Monte Carlo, Monaco.". MTV Networks. MTV (Viacom). Retrieved 31 January 2014. ↑ Singh, Amrit (18 February 2009). "The 2009 BRIT Awards Looked Like This". Stereogum. Spin Media. Retrieved 31 January 2014. ↑ "Sam Sparro – 21st Century Life (CD, Maxi-Single)". Discogs. Zinc Media, Inc. Retrieved 31 January 2014. ↑ "Estelle Feat. Kanye West – American Boy (File, AAC, Single)". Discogs. Zinc Media, Inc. Retrieved 30 January 2014. ↑ "Estelle Feat. Kanye West – American Boy (CD, Single)". Discogs. Zinc Media, Inc. Retrieved 30 January 2014. ↑ "Estelle – American Boy (File, WAV)". Discogs. Zinc Media, Inc. Retrieved 30 January 2014. ↑ Estelle (2008). Shine (Liner Notes) (Compact Disc). Estelle. London, England: Atlantic, HomeSchool. ↑ "Austriancharts.at – Estelle feat. Kanye West – American Boy" (in German). Ö3 Austria Top 40. ↑ "Estelle – Chart history" Canadian Hot 100 for Estelle. Retrieved 4 April 2012. ↑ "ČNS IFPI" (in Czech). Hitparáda – Radio Top 100 Oficiální. IFPI Czech Republic. Note: insert 200828 into search. ↑ "Ελληνικό Chart". Ifpi.gr. Archived from the original on 2 July 2010. Retrieved 2010-06-20. ↑ "Estelle – Chart history" Japan Hot 100 for Estelle. ↑ "Norwegiancharts.com – Estelle feat. Kanye West – American Boy". VG-lista. ↑ "Swedishcharts.com – Estelle feat. Kanye West – American Boy". Singles Top 100. ↑ "Turkey Top 20 Chart (June 7, 2008)". Billboard Türkiye (in Turkish). Prometheus Global Media. Archived from the original on 11 June 2008. Retrieved 2 February 2014. ↑ "Archive Chart: 2008-03-29" UK Singles Chart. Retrieved 6 April 2011. ↑ "Estelle – Chart history" Billboard Hot 100 for Estelle. Retrieved 4 April 2012. ↑ "Estelle – Chart history" Billboard Pop Songs for Estelle. Retrieved 4 April 2012. ↑ "Estelle – Chart history" Billboard Hot R&B/Hip-Hop Songs for Estelle. Retrieved 4 April 2012. ↑ "Estelle – Chart history" Billboard Adult Pop Songs for Estelle. Retrieved 30 April 2012. ↑ "ARIA Charts – End Of Year Charts – Top 100 Singles 2008". Australian Recording Industry Association. Retrieved 2014-01-31. ↑ "Jahreshitparade 2008" (in German). Ö3 Austria Top 40. Retrieved 2014-01-31. ↑ "Jaaroverzichten 2008" (in Dutch). Ultratop 50. Retrieved 2014-01-31. ↑ "Rapports Annuels 2008" (in French). Ultratop 40. Retrieved 2014-01-31. ↑ "Canadian Hot 100 Year-End 2008". Billboard. Prometheus Global Media. Retrieved 2012-03-29. ↑ "2008 Year-End European Singles". Billboard. Prometheus Global Media. Retrieved 2014-01-31. ↑ "ARIA Charts – End Of Year Charts – Top 100 Singles 2008". Australian Recording Industry Association. Archived from the original on 25 September 2013. Retrieved 2014-01-31. ↑ "Single Jahrescharts 2008". MTV Europe (in German). Viacom International Media Networks. 16 December 2008. Archived from the original on 27 December 2008. Retrieved 26 January 2014. ↑ "MAHASZ Rádiós TOP 100 - radios" (in Hungarian). Rádiós Top 40 játszási lista. Magyar Hanglemezkiadók Szövetsége. Archived from the original on 10 October 2012. Retrieved 2 February 2014. ↑ "Irish Charts - Best of 2008". Irish Recorded Music Association. Retrieved 2012-01-14. ↑ "Jaaroverzichten" (in Dutch). Dutch Top 40. Retrieved 2014-01-31. ↑ "Årslista Singlar – År 2008" (in Swedish). Swedish Recording Industry Association. Retrieved 5 January 2011. ↑ "Swiss Year-End Charts 2008" (in German). Swiss Hitparade. Retrieved 2014-01-31. ↑ "Chart Plus Year End 2008" (PDF). Official Charts Company. Retrieved 27 January 2014. ↑ "Billboard Hot 100 Year-End 2008". Billboard. Prometheus Global Media. Retrieved 2012-03-29. ↑ "Episode 2". Chart of the Decade. 31 December 2009. British Broadcasting Corporation. BBC Radio 1. Retrieved 26 January 2014. ↑ "ARIA Charts – Accreditations – 2008 Singles". Australian Recording Industry Association.